Ross builds polished vessels and reactors, pressure vessels and atmospheric tanks, columns and large diameter pipe to meet the special needs of many industries. State of the art production machinery and design facilities at each of our fabrication plants give us the control necessary to offer flexible service and air-tight quality assurance. 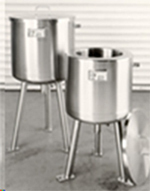 Our fabrication plants are ASME code certified and can provide the ASME stamp when required. Our engineers, machinists and fabrication specialists routinely meet such code requirements as USFDA, BISC, ABS, API and UL as well as ASME. We regularly work with a broad range of materials, including carbon steel, 316 and 304 stainless steel, Monel, Hastelloy, Titanium, Inconel and aluminum.